Last week we went on a last minute vacation to Maine and it was awesome! It had been on our list of places to go for some time, and we finally made it work. We booked a super rad house rental and spent a few days exploring the beautiful state. We started out in Portland. The architecture was pretty, pretty, pretty cool. I didn't know it was here, but am very glad that I stumbled upon the Angela Adams store in Portland, ME. The design studio is based out of Portland and their showroom was divine. The rugs and furniture were beautiful. I even dug the taxidermy hawk that you can see in the background. We also made a stop at the Holy Donut. They make them out of potatoes, which is interesting and made for a heavier donut, but it tasted great and wasn't as heavy as you would imagine. They only had one flavor left, chocolate sea salt, but it was superb. I'm also very glad that I painted my nails for this picture; I hardly ever paint them. We also had some killer oysters at Eventide Oyster Company. They had this large rock embedded into the bar to display the oysters. It was so cool and the oysters were delicious. The weather was perfect for the whole trip. The house we rented was located in Wiscasset, ME, which was a super cute tiny town which just so happened to be famous for the most delicious and famous lobster roll. It was the first dinner of the trip and was pretty much the only thing open in Wiscasset for dinner (Red's Eats). Everything closes really early in Maine, at least where we stayed. Anyway, the lobster roll was gigantic and had probably about 2 lobsters worth of meat in it and no filler. It was basically two very delicious lobsters on a roll with butter for $24. We had many, many lobsters on this trip and they were the best. The view from the town of Wiscasset at night. Below was the view where I ate yet another lobster. Imagine that. These colorful things that you see everywhere are bouys. Each fisherman has a different color and pattern on his bouy to mark where his lobster traps are located. Maine is serious about lobster. It is seriously EVERYWHERE. I ate it probably two times a day and greatly miss it. We took a day trip to Bar Harbor and Acadia National Park. Since it was a pretty far drive (2.5 hours) we didn't have much time to spend there, but we did get to see how beautiful it is. We plan to take another trip to Acadia at some point and will explore more of the park. Most of the coast of Maine is rocky and picture perfect. We took a sailing trip on a sail boat. We found a small boat that takes a group of a max of 6 people on an old wooden sail boat. They are called Sail Moscongus and the boat is the Sarah Mead, sailed by Captain Randy. We dodged a bullet when we arrived to the dock and found a family of 4 with two small kids who were crying and were not into being on a boat at all. The boat captain talked them into taking a separate trip after ours, hoping the kids would not be as upset. So we lucked out and had the trip all to ourselves. And the kids were cool (aka, not crying) when we returned, so it worked out for everyone. This is an awesome lighthouse on an super small island, but I forget what it was called. I would also like to point out that I felt like the biggest poser while on this boat. I have two sailing themed tattoos and am not a sailor. Ha. Once I realized this, I felt like I had to keep making sure my thighs were 100% covered and not exposed. But this also made me realize that I do need to finally learn how to sail and they have lessons right in Philly. So hopefully that actually happens this fall. We sailed all around Boothbay Harbor, which was so beautiful. Each town was prettier than the next on the whole trip. We sailed to their lobster trap and found 3 of them in it. They have to measure each one, and if it is too small you have to throw it back. You also have to throw it back if it is large enough, but carrying eggs, or has ever carried eggs. If a fisherman finds one with eggs, they notch the tail to mark it so that no one can ever take a breeding female. And, uniquely to Maine, you also have to throw it back if it is too large. They figure if it has lived this long, let it live out the rest of his life. One of the three in the trap was just right to keep. The coast of Maine is so, so beautiful!. And the water is so, so cold. Here was our view from spot in town at Boothbay Harbor. The place was not great, so I will not recommend it. But who cares when you are on vacation, and this is the view. There is a tiny house in the middle of the bay. A walking bridge goes across the bay, and right in the middle is this house. No one lives there now, but they used to. How cute! And here is the very cool house that we rented. It was located in the middle of nowhere and surrounded by the forest. It was so awesome! It's solar powered and the amount of stars that you can see at night will take your breath away. Here's the rental listing. This house was a pleasure to stay in. It was perfect for us and had the best views out of all of the windows. They had a vase in the cabinets, so of course I had to fill it with some wild flowers from the property. I completely lucked out and on our way out of town Wednesday, there was a flea market that had so much great stuff! I wish I would have bought more things! But there is always next time. We'll just have to go again and flea market shopping with be at the top of my list. Improving our stairwell has been on my to-do list for years, and we have finally done it! Having a husband who has off all summer is great. I wish I had some before pics, but they are on our other computer, and I am too lazy to switch them over to show you. Anyway, imagine an always dirty cream carpet covering these stairs. And a handrail that was dark brown. We (Dave) pulled off all of the carpet, uncovering the wooden stairs, which we painted black. What was under the landing was a mystery, but it ended up being an ugly linoleum. So we (he) also ripped that out and we laid down some unfinished hardwood. Initially I was going to paint that black as well, but it looked too good to paint so we just poly-ed it. I actually can take credit for the poly and helping with the painting. The handrails and the coat rack was painted my favorite color, ORANGE. I love it! The best part was this whole project cost around $400. The flooring and supplies were around $300 and the paint and stain was another $100. I plan to someday hang plants in the landing, which has a skylight. I bought pulleys about 2 years ago, but still haven't gotten that together. One day I will and I will be sure to share it with you. A huge thank you to everyone who came out for my first POP UP shop on Sunday! I had a blast hanging out with you while you shopped in my house! The process of setting up for it was fun too. Basically I redecorated my house with vintage housewares, plants, flowers and pillows from my shop. Also sprinkled in the mix was art by my very talented artist friends. This area is usually our bar, but became a milk glass collection. The pillow on the left is a quilted pillow. I designed the colorful subway tile fabric with the website Spoonflower. I used a photo that I took of the Market East (Jefferson) train station in Philadelphia. The station has a two huge walls of tiles that from far away are a trees, but from most vantage points they just look like random angled subway tiles. I took a photo and did a mirror repeat to make a cool design. My friend Jason Koons, who creates papercut art, had several pieces hung throughout the house. This intricate tree was created by cutting paper with an exacto knife. And here is one of his large papercut stars. My photography skills do not do them justice, they are the coolest. The one above and two below are all sold. I really wanted the top one in the photo below, but my friend Ben snagged it before I bought it. Jason does custom work, so we are going to commission something cool. 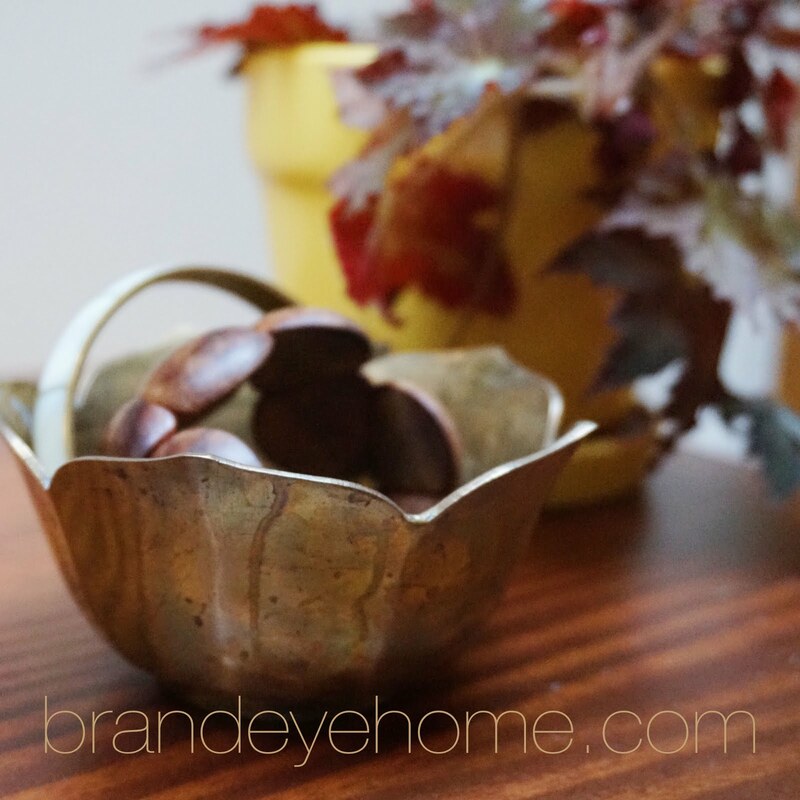 The brand*eye home vintage planters and plants were a hit. The happy shopper Pia taking a break after a karaoke session. Oh yeah, there was also karaoke, hot dogs and chili compliments of my husband Dave. We can't invite people over to our home without feeding them, and as soon as anyone mentions karaoke it's on.